One of the adjustments that is part of life once you end your working years is adjusting to living on a different kind of income. We get used to that regular paycheck over the life of our careers in the working world. And while we may be very happy to leave the stresses of the workaday life, that paycheck is one part of that world that we may miss when they finally stop. Of course, many senior citizens have some resources going into their senior years such as savings, investments, a retirement program and, of course, Social Security. But the thing that’s hard to get used is that you are now drawing funds from a limited pool. Whether the amount of your retirement resources is big or small, outside of the income from interest and dividends, you are no longer replenishing those funds. It seems strange to say it but we have to think about how long we can live on those funds. While we would all like to live to 90 or older, from a practical point of view, we don’t want to “outlive our savings” and then become a burden to our children to support as they are working hard to raise and support their young families. So the life of senior citizen means going on some form of budget. And anything we can do to stretch the use of those retirement funds means that they will last longer as we continue to do the right thing for our health with diet and exercise so we can live a long life of a senior citizen. One resource that is worth taking a look at are programs that are geared to helping senior citizens conserve on their limited funds. One such resource is the phenomenon of the “senior discount” which is often offered at restaurants and other retail institutions to help us out. While you may be working to look young and defeat the influence of age on your health and looks, when it comes to senior citizen discounts, it's time to be honest about your age and take advantage of any help that is being offered to stretch your fixed income as much as you can. Public service companies such as your electric, gas or water companies also have programs that you can take advantage of to keep those bills under control. The one thing you want for the sake of the budget is that your bills will stay the same from month to month. But when your gas or electric bill changes a lot because of the influence of the hot summer temperatures or the cold winter months which use a lot of home heating fuel, those bills can get pretty erratic. So contact your utility companies and see what they can do for you. One program that is available to everyone is averaging your monthly utility bill. The gas or electric company can do a quick calculation of your last year’s usage and average that and then bill you that fixed amount each month. In this way, you will know each month exactly what to expect so you don’t have any “surprises” in the mail when the bills come due. Keep your eyes open for ways that the public institutions you use the most work to help out senior citizens. 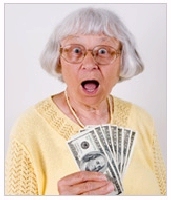 They know that you are on a fixed income and nobody wants to see seniors struggle to make ends meet. Sometimes your local or state government may even have programs to reduce your sales taxes at the grocery store. Take advantage of these plans and don’t let yourself feel bad about it at all. You have worked hard all your life to support others and to be a good citizen. So let society pay you back with whatever help can be offered. You certainly deserve it.